Designed for accurate and efficient curve cutting. As there is an increasing demand for CNC Band Saw in combination with customized products with flexible specifications, this machine is specially designed to suit specific production requirements. In addition, to meet mass production requirement, this machine is equipped with automatic material infeed and automatic product outfeed using a conveyor belt. 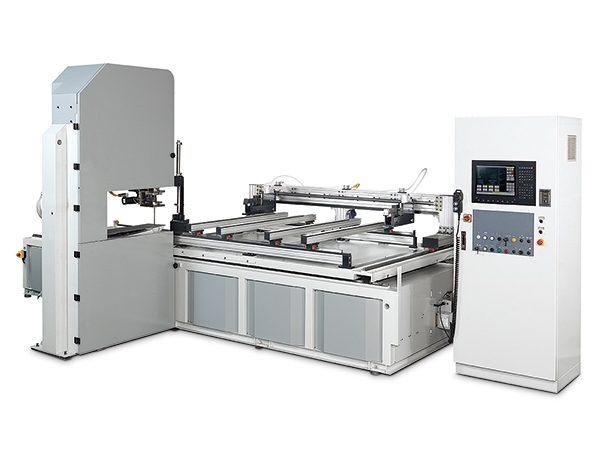 Advanced CNC control features powerful function and easy operation. High efficiency curve cutting without need of copy template. Band blade swiveling angle: ±90˚. Automatic material infeed system combined with automatic product outfeed system to achieve fully automatic cutting operations. All travels are driven by servo motors combined with the use of linear guide ways. Aluminum alloy automatic feeding mechanism features light weight, maximum durability and elegance. Rugged machine construction exhibits outstanding stability. Various automatic material infeed systems to choose from. Material infeed calibration device allows higher accuracy of product. Note: The manufacturer reserves the right to modify the design, specifications, mechanisms....etc. To improve the performance of the machine without notice. All the specifications shown as above are just for reference.